It's funny how we're suddenly getting stories about fictitious Houdini offspring. Last week saw the release of a novel featuring Houdini's daughter. 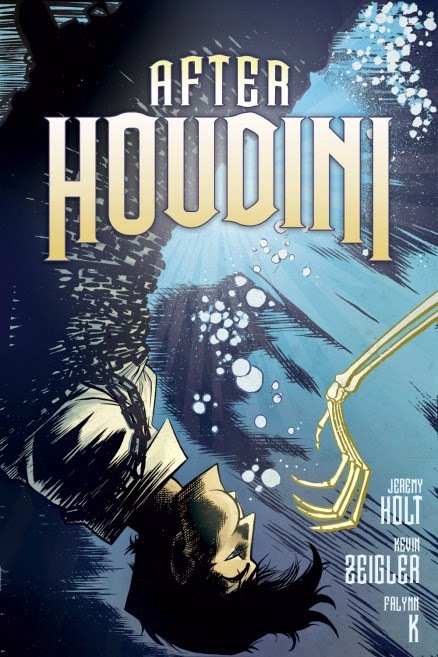 Now we have a preview of an upcoming independent graphic novel, After Houdini, starring Houdini's son. Of course, Houdini didn't have a son, but that's what makes it fantasy! "I wanted to share a very special preview of the new cover for my series After Houdini. I’ve revised the title due to the fact that I don’t want readers to be confused with the fact that the protagonist on the cover is NOT Harry Houdini, but his son Josef. We’ve received very strong interest from some big publishers, so check back here for further developments." Here's hoping we'll all get to enjoy the adventures of Josef Houdini sooner than later. And if you're curious what the original cover looked like, just click here. You can also see some preview pages from After Houdini at Graphic Policy. UPDATE: Amazon shows the book will be released in April 2017 and can be pre-ordered here. I am so glad you found our comic! My name is Kevin Zeigler, the artist and co-creator of After Houdini. I actually spent quite a bit of time flipping throughout your blog while making this! Hey Kevin. Thrilled to hear you browsed my blog when doing this. Haven't grabbed a copy yet. Is it available as a print edition? So far I've only found the online preview. Jeremy Holt here. Kevin alerted me to your post. We're absolutely flattered! Thank you for the plug and support! Unfortunately, print copies are not available at the moment. We're looking into remedying that soon, but in the meantime, I'd be happy to send you a PDF copy. Feel free to email me, my address is on my blog.